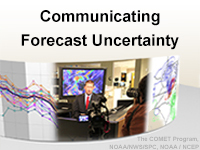 This scenario-based lesson introduces the topic of communicating forecast uncertainty to decision-makers, such as emergency managers, related industry professionals, the public, and other end-users. In a case that spans the lesson, learners begin by developing a forecast discussion using deterministic data, refine it with probabilistic ensemble data, and evaluate how well it conveys uncertainty information. Then they assume several end-user roles, assessing how well the forecast discussion addresses their needs. From there, important research findings on communicating uncertainty are discussed. In the lesson’s culminating section, learners apply the findings as several decision-makers call the forecast office, requesting specific weather information. The lesson is intended for experienced forecasters knowledgeable about mid-latitude weather regimes, although it will be of interest to the academic community as well. Helped me to understand the two-way communication better between end users and forecaster. Just not a fan of the format. This is a good exercise in analyzing ensemble data and then meeting the needs of various users. It is very appropriate for those with limited experience with ensemble data, or little experience handling user inquiries. It provides good illustrations of the diversity of needs of differing user groups. All good, interesting and dynamic way of presentations. I think that the use of mm and cm was occasionally incorrect. It certainly confused the issues of what amounts were both forecast and also important to the user, as forecasts never reached 50cm (of precipitation). Confusion of liquid vs frozen amounts in metric clouded the real effort of making more informative forecasts. Sticking to all-liquid should remove this complication and clarify the data for the course attendee. A well done lesson. Taking the role of the forecaster, it's easy to get swept up in focusing on dynamics and certain aspects of the ensemble forecast and forget the position of decision makers asking for weather variables I don't normally always consider immediately when going about analysis. Not sure how much of the information is pulled via direct correspondence versus polling. Polling may lead to some responses where the user is more willing to give information because they think it might be useful and miss other details because they are thinking solely hypothetically - such as probability of precipitation directly affecting road conditions, especially given how probabilities of precipitation tend to get interpreted. Overall, an excellent lesson, but feel it would be more effective if there was a better segue between switching from the forecast role to the decision making role - perhaps better accomplished with section 5 and 6 swapped about. Will definitely keep the lessons learned in mind though. A useful refresher, can be applied to any meteorological service. Good module overall and on a topic that many meteorologists need to improve upon. However, I do agree with one of the previous reviews that the use of metric units is not appropriate for this scenario given that it is a US based situation and that most US end users are not going to be looking for metric units. The biggest problem with lesson is the use of the metric system. This not, repeat not, a paper where SI units should be used. This is a lesson to teach "real world" application and in the U.S. decision makers use the British system (miles/feet/inches). This is why the NWS sends out its forecasts and products in the British system and no metric. The metric system makes little sense to a lot of people (the bulk of the end users of weather information in the U.S). In some cases, (T, Precip) the British system is better as it is a higher resolution than the metric. This is a brig deal to power companies (which I have directly supported and they have told me this directly). It much harder for them plan electric loads using C compared to F as one degree C can mean as much as three degrees F in some cases. If the temperature is within their "critical" values, one degree F can mean tens of millions. Image if that was a degree C in the same range. The power company would have a big problem. While we as forecasters understand it, it is important to teach a lesson which directly affects our customers in the units our customers would use. Great information and understanding in communicating with the general public concerning uncertainty.